Floors, in general, take a lot of abuse. But if there is a single spot in your home that begs for beautiful, high-traffic flooring, it is the entryway, especially in busy households. The best entryway floors stand up to all the moisture and dirt that gets tracked through a threshold. They are also a snap to clean, so there is no stress about (uh-oh!) mud or puddles. Whatever the size of your entryway—whether it is a pint-size vestibule or cavernous foyer—these smart flooring ideas will help you create a more functional and stylish entryway. There is so much to adore in the above cheerful entryway by blogger Jillian Harris. For starters, behold the cement tile floor. The pattern tiles are from the Cement Tile Shop, and the style is called Atlas 1. Equally welcoming is the bright yellow door in Hannah banana by Benjamin Moore. These particular tiles are made of Portland white cement, which is a mixture of limestone, marble, and natural colorants. The latter creates the baked-in pattern on top of each tile. Son's Up is a beach house built by Richard Moody and Sons Construction. One of the home's luxurious touches is the beach pebble entryway floor. The smooth stones provide a little grip that keeps wet feet from slipping. Pebble tiles like these are sold by the foot on a mesh backing for quick installation. Zoë Feldman Design is the Washington, D.C.-based firm that gut renovated this gorgeous Capitol Hill townhouse. There are two things we love about the entryway shown above: the black-and-white-patterned floor tile and the inner glass door that provides an extra layer of insulation. If you do not have the budget to replace the old wood floor in your entryway, consider refreshing it with paint and a stencil. In this Swedish apartment spotted on Alvhem Makleri, antique flooring gets revived using porch and patio floor paint. It is perfect for creating a durable surface that can handle the beating that comes with heavy foot traffic. It is important to note that most types of porch and patio floor paint are oil-based and paints like these pollute indoor air. But if you are looking for something that offers long-term protection and coverage without the harmful fumes, there is a growing number of water-based paint options on the market. Two brands currently selling more environmentally friendly porch and patio paints are ECOS Paints and Rust-Oleum. In this Palm Springs home by Sarah Mora, the blogger behind A House in the Hills, the polished concrete floor in the entryway makes a stylish first impression. Polished concrete floors come with lots of benefits. They are incredibly durable and relatively cheap to install—you can expect to pay around six dollars or less per square foot. Plus, unlike other types of flooring including wood or tile, minor imperfections such as subtle cracks will enhance the beauty of a concrete floor. They also are easy to clean. The wood floor in this bright entrance seen on Boligcious got a colorful lift using a water-based marine paint in high gloss turquoise. As its name implies, marine paint protects boats above and below the waterline. Because it is designed to shield surfaces from the damaging effects of moisture, it is an excellent paint for entryway floors. Christopher Burns Interiors based in New York installed a slate tile floor in this charming entryway. Because the slate tiles are in several different shapes, they lend pattern to the entrance. What makes slate tile so great? First off, slate is a durable natural stone. Combined with its classic good looks, slate flooring is an excellent choice that can increase the value of your home. Add a little old-world appeal to an entryway with a brick paver floor like this one installed by Patrick Ahearn Architecture based in Boston, Massachusetts. Because bricks can absorb moisture, it is best to protect them with a waterproof sealer especially if you live in an area prone to wet weather. You will need to apply a fresh coat of sealer every couple of years to prevent wear and tear. You can get mighty creative with small hexagon floor tiles. They are an old-school favorite typically found in decades-old buildings. You can arrange them in a nearly endless number of patterns. In this small entryway, Tim Barber Ltd combined black and white hex tiles to create a historic cross and floral design. Many home improvement stores sell teensy black and white tiles like these arranged in retro patterns. They come on mesh sheets for quick installation. 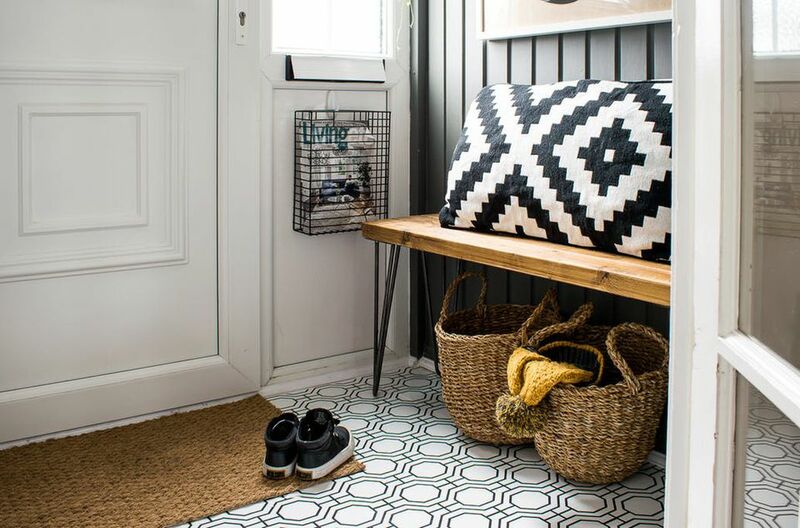 The porcelain floor tiles in this small entryway by Homepolish will stand up to muddy shoes and wet boots. Why is that you may be thinking? Compared to ceramic tile, porcelain is stronger and more stain resistant making it a better choice for hardworking entryways. Porcelain floor tile has its pros and cons. In this home, by Havenly the polished concrete floor, which covers both the entryway and living room, has a simple scored pattern (as shown on the left) that resembles large format tiles. Claire Staszak, the Chicago based interior designer, behind Centered by Design made this entryway pictured above more welcoming with ceramic floor tiles by Merola Tile. The geometric pattern is called Twenties Petal. Studio McGee, an interior design company, based in Salt Lake City, Utah, installed this beautiful entryway floor. The hardwood is French white oak, a resilient material once used for shipbuilding. While this type of wood is naturally rot-resistant, it needs extra protection when used as flooring. After installing these planks, several coats of waterproof sealer were applied to guard against potential damage. Christina Blake, the blogger who pens And Christina, covered the old wood floor in her extremely bitsy entryway with black hexagon floor tiles. To minimize her time spent cleaning, she went with black grout. It hides dirt better than grout in light shades. The project was done and dusted in five hours, not including the two days it took for the mortar and grout to dry. Turn your address into a striking statement with this entryway idea by Kathryn Ivey Interiors based in Washington D.C. The hexagon tile floor features the home's house number. Let's say that you hate the ceramic tile in your entryway—and you cannot afford to rip it all out—what to do? Kelly from the crafty blog Moon and Me gave her blah, neutral tiles a spanking new look with chalk paint. Afterward, she protected her checkered creation with a water-based sealer. This entryway floor by Erin at The Sunny Side Up Blog only looks insanely expensive. Her thrifty idea combines affordable, wood laminate flooring with faux stone tiles to create an elegant inlay pattern. Slate tile floors like this one installed by Kelly at The Lily Pad Cottage are perfect for entryways. The natural stone material is both slip and stain resistant. It also has a lovely grooved texture that adds a little character to spaces. To keep a slate floor looking like new, you should maintain it well and apply a stone sealer every year. Blogger, Lindsay Aratari from Aratari at Home, despised the green tiles covering the floor in her small entryway. Unfortunately, replacing them was not within her budget. So she gave them a face-lift with chalk paint. It is a decorative paint that will adhere to most clean surfaces. She created the pattern with a reusable stencil called August by Cutting Edge Stencils. To get started she gave her old tile floor a good scrubbing. Afterward, she prepped the floor with an all surface primer. Next, she applied three layers of white chalk paint. Then she got stenciling using charcoal chalk paint. Once her new floor was thoroughly dry, Lindsay protected the surface with a clear top coat. With the right flooring, a beige entryway is anything but boring. Instead of installing plain, square tile, David Michael Miller Associates based in Scottsdale, Arizona gave this neutral entryway extra zing with a diamond pattern floor. There is no doubt that beautiful hardwood floors add value to homes. But which type of wood works best in entryways? Walnut is one of several exceptional choices. Its chocolate brown color will hide dirt between cleanings. The trick is not going too dark. We love the walnut floor in this entryway by Sheila Mayden Interiors based in Seattle, Washington. If the floor were any darker, it would show off dust. Interior architect Daniel Heckscher transformed his white, cookie-cutter entryway with porcelain tile. The floor features a white brick tile in a herringbone layout. The dark gray grout enhances the pattern with a pop of dark color. In this small entryway, Amy Vermillion–an interior designer based in Charlotte, North Carolina– installed gorgeous slate planks in charcoal black. For the most bang for your remodeling dollars, consider slate tiles rated for both commercial and residential use. Another good slate tile tip to know, slate floors require daily sweeping. It is especially true for the first six months. Newly installed stale goes through a flaking process called spalling, which generates dust. Say hello to this stylish entryway by Third Coast Interiors based in Chicago, Illinois. The porcelain tiles on the floor are by Merola Tile. The design is called Arte Grey. We love the old-world pattern because it is both trendy and timeless. Emily, the home improvement blogger from Merry Pad, always wanted a stone entryway in her home. But it had to be done on the cheap. What was her solution? She picked up dozens of shale stones from the shores of Lake Erie and got to work. You might be thinking that shale stones break easily. And you are right. That is why Emily did a few tests to see how the rock would stand up as a flooring material. She discovered that packing the stones in mortar prevented cracking and chipping. The flat gray stones were installed over her old tile floor. After mortaring them into place, she let her project dry for two days before grouting. Emily loves how her project come out. Not only does her new floor look great, but she says it also feels good underfoot—win-win. Jolie Dionne from Vintage Meets Glam had hardwood flooring in her entryway, but it was not working out. Water damage left the planks cracked, buckled, and warped. She and her husband Dan tore out the old floor in the entryway. Because the wood floor extended into the living room, they created a transition line with a plunge cutter. Next, they installed a cement-based board to tile over. The couple chose grippy, slate tile by Daltile in black. Jolie finished up her project with dark grout gray, which will hide dirt and stains. We have no problem with renting unless you are stuck living with an eyesore entryway floor you cannot tear out. If that is your situation, it is time to rejoice. This idea by Medina at Grillo Designs shares how to hide an unattractive laminate floor with wallpaper—yes—wallpaper. Unlike painting a wall a super dark color, her idea is 100 percent removable. So no worries about your security deposit. Medina says this project is best suited for small square footage. For best results use removable, peel-and-stick vinyl wallpaper. Vinyl is easy to clean and is far more resilient than other wallpaper materials. And unlike wallpapers that require a paste to hang, peel-and-stick options come with a sticky backing. After Medina covered her entryway floor with wallpaper, she protected her new surface with fast-drying polyurethane with a satin finish.